Hey lovelies, how is your week coming along? That’s it you guys! It’s coming before we know it! The Holidays that is. Every year, when it hits Halloween, it’s the count down time for me to the festive season and most importantly, the …year-end SALES. The only exception to that, as much as I’m excited for this period time of the year, I’m not looking forward to the heavier rain and brutal cold of the Northwest. You might heard enough about it, but I have never experienced that much rain my whole life since I moved here last year. Colder weather climate calls for the layering action. I have collected quite a lot of such piece since the move. Loving everything about this Halogen long vest I got from Nordstrom a couple months back. The black/white contrast pattern, the thick structure, and the length making styling of this piece endless, so stay tuned for more! 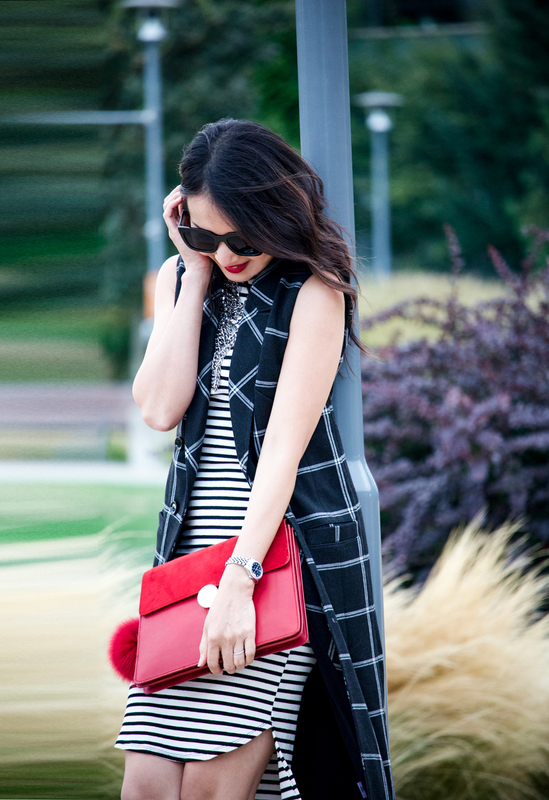 Being venturous with textures and patterns today, I opted for this striped midi (also seen HERE). I don’t often do this kind of mix, but I think that will change from now. I know I’ve been missing the fun of that aspect and often navigate to safe choices, but made a promise to myself to put more fun in fashion, so yep! considered that my early New Year resolution. As always, thanks so much for stopping by and wishing you a wonderful weekend ahead. You look great dear, love that red bag! Loving the windowpane pattern of the vest – very chic and modern <3 🙂 The knee-length makes it even more perfect! So sorry I've been so MIA, My Linh! Hope you're been well! Really miss your blog and posts!